Got a call Friday afternoon from Wayne, a local fisherman who went to the refuge with his brother. They hit big blues during the afternoon from the top of the tide to the outgoing tide. They used both metal and top water lures and the fish hit it all. Other news from Friday is that some small stripers were caught down in the mouth. And we have a few interesting bit and pieces from the Drive-on guys who are coming off the beach from the weekend. First The Kelly Boys came in. They fished late Saturday until late Sunday morning. 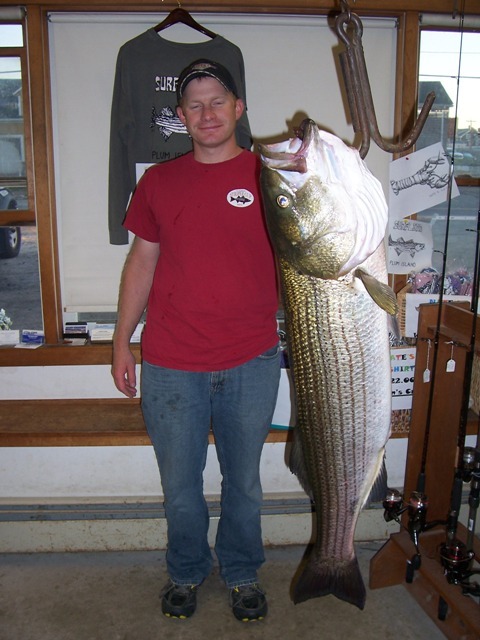 They reported 3 keeper sized bass (bigest being 35″) and also a number of small stripers in the 18″ range. That is nice to hear. They have been missing a bit this year. Tommy, again seems to have some very strange luck . This morning around the low tide he caught a large bluefish on a worm very close to shore. That is a rarity that they take a worm. No one else caugth any blues that were in there group. Next in was Nancy and Rick. They have been around since Friday early evening. 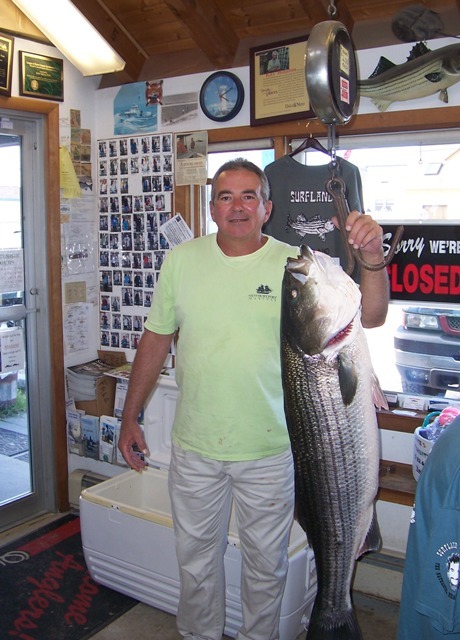 Nancy reported a few fish, a 24″, a 28″, and a 30″ all caught on worms. Not much action for them this weekend, but Nancy cooked up a mean breakfast for themselves and the Kelly Boys. Then we had Terry and Dave pass through to give us a report. Terry reported only one small fish for himself. But………..there seems to be a “bait stealer” in our mist. Yesterday during the high tide something was going on with their bait. They were reeling in to find only the head of the worm left on their hooks. Finally Terry reeled in the culprit. WINDOWPANE FLOUNDER, also know as Sand Dabs and other names. Seems that the spot they were in a group of juvenile flounder (6″-8″) were having a feast on the worms. These little guys can strip a worm without you even knowing it. The rod hardly, if at all moves. On a brighter note, nice to see them around. 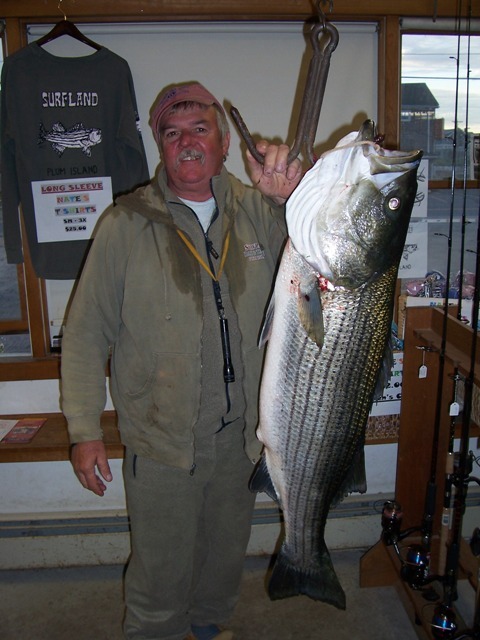 Dave also reported only one small striper (26″) that he caught this am. Seems like Donny was the lucky one out of this group. Donny caught and released 4 keepers (28″-32″) last night between 8-10 pm. That was the deadlow tide and the start of the incoming for those that don’t have a tide chart in front of you. Again, WORMS. Again, when Terry was asked if he wanted a snack we had in the shop he reported that he was stuffed. They had egg sandwiches on the beach this am. But, Terry says that “My Dog Pete’s” Chili and smoked striper fish dip along with his cooked trout was the hit at Saturday night’s feast. What am I missing. Think I might head down just for some grub! Next………..comes Mr. Pete Beard from Deering, NH (but you would swear he’s a Mainer!). He was fishing the Maine coast last night on again, chunk mackerel, and caught this 31-7 lber. The one boat picture I can share with you is this one. Greg Bonocorsi from Salem NH was drifting mackerel along the oceanfront (our oceanfront) during the incoming tide yesterday 9/17 and caught this 40-8 lber. Not a lot of fish out there…I fished Friday and Saturday…lots of guys around me and myself came up empty. Talked to a lot of guys who all said that they are having a horrible season. There are bass and blues but in small small numbers. I circumnavigated Cape Ann yesterday afternoon, from Gloucester Harbor to the north, thru Sandy Bay, around the points, with a wide swing thru Ipswich Bay toward Crane, concluding up thru the Annisquam. …nary a single blitz to be had. Maybe there’s some spotty fishing these days for intrepid retirees and single guys who have hours and hours to put into it, but for the rest of us, it’s a different, frustrating story. …haven’t given up hope, though, and will continue to watch the reports and get out when I’m able. I went out and trolled umbrellas both Saturday and Sunday with large blues attacking the rigs both days. Saturday the ocean was flat and I saw several large schools of tinker macks under attack by blues along the tide rips in about 30′ of water. No stripers but lots of big blues. Also saw “Speedy” catching a few blues in the waves yesterday. …glad to hear this; was this off of PI?? Thanks. Tell Billy the worms he sold Meghan and I worked well yesterday afternoon. Everyone was home watching the football game. Lures worked too. Yes Irish, right off the beach front. Mostly between lots 1-6 with the best action between the last houses and lot 3.
hows everyone been doing this week??? anything juicy?